In the space of a week, games were announced from the two biggest franchises in the military shooter space and opinions have been startling in both their strength but also in their number. First out of the gate was Call of Duty: Infinite Warfare – developer Infinity Ward’s follow up to their first stab at a future shooter with Call of Duty: Ghosts. In many respects this new game gives me the impression of being the title the original leadership at Infinity Ward wanted to make before their falling out with Activision lead them to form Respawn Entertainment and produce Titanfall. The negativity towards the trailer has been unprecedented and is giving the Ghostbusters reboot trailer a run for its money. With over two million dislikes already, why is this going all wrong now? There’s probably a few things going on here with the first being fatigue. The concept of “franchise fatigue” has often been discussed in relation to publisher Activision’s failing when it has come to Call of Duty and other properties such as Guitar Hero. The tendency to churn out new titles yearly may leave fans tiring of the games and what they represent. To their credit Activision have made an attempt to inject some fresh blood into the franchise by having alternating releases by three developers – original developer Infinity Ward, Treyarch and the new team at Sledgehammer Games. But now that a full cycle of releases have come through with Ghosts, Advanced Warfare, last year’s Black Ops 3 and now Infinite Warfare they’ve stumbled into what could only be described as “theme fatigue”. Who on earth at Activision thought it was a good idea to have all three teams make future tech shooters? With three teams you’d think it would have been a perfect opportunity to have games in different settings such as past, present and future where each could build on their own timelines and have something clearly differentiating them. But what we’ve ended up with here are games that are all trying to borrow and steal future tech concepts from each other and see who comes out on top. How is that going get fans excited for the next game from any of the teams? Then there’s the trailers. The teaser trailer was interesting in that it reminded me of a similarly styled teaser for the movie Man of Steel which used General Zod’s message to the world; if nothing else it establishes who or what you’re going to be fighting against in the game. The full trailer is then used to flesh out the story further while showing a game in its best possible light, usually in the form of demonstrating shiny new graphics or elements of realism not seen before. This time I’m not so sure as it comes across as being decidedly generic. Though it does show a transition between ground and space combat happening seamlessly (avoiding loading screens altogether would be a neat trick) there’s not enough indicating there is a big enough leap forward in visual quality or other technology to impress. And with many campaigns in the franchise following a template originating all the way back to the first Modern Warfare, the ability to create the kind of spectacle that feels fresh can become harder after every attempt. Advanced Warfare had the advantage of Kevin Spacey chewing at the virtual scenery but it seems not every title is going to have that kind of star power to draw player’s attention. 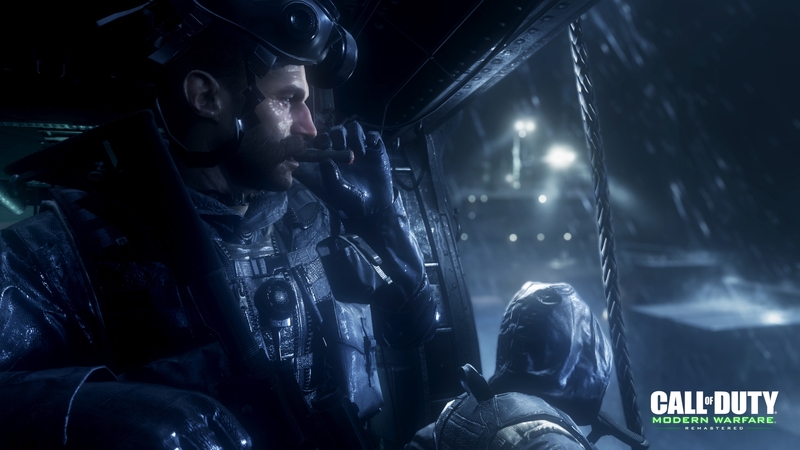 A remastered edition of Call of Duty 4: Modern Warfare received more buzz than the game it’s being bundled with… not quite according to plan. As if mentioning Modern Warfare here wasn’t enough, perhaps the biggest WTF? moment was the actual announcement in the trailer of a remastered version of Call of Duty 4: Modern Warfare being bundled with the new game. There are already jokes are floating around about people buying Infinite Warfare just to get this so instead of adding A LOT value to the new game it may work in reverse and lessen the perceived value of it. If you need to throw in a new version of what is still considered the defining game of the franchise, how good can that new one really be? In contrast, considering we’re in the era of remasters it seems bringing Modern Warfare back would work well enough as a standalone release, which is something it will likely be in the future, so why associate it with a title that may put people off from buying it again? A week later developer DICE’s next game surprised many by going deep into the past for inspiration; in this case the first world war. In contrast to the reaction of its Call of Duty counterpart, there has been an incredibly positive reaction to the announcement with more than a million likes already. So why is this working? World War One holds much more significance to Europe and its neighbours than it might do for other countries around the world despite many others contributing. From those quarters there is likely some concerns about glorifying the conflict through a video game but there would also be others excited at the prospect of a major developer and publisher finally recognising that WW1 is a valid subject. For me, how DICE approach the campaign will be interesting to see. Admittedly that is not the focus of the Battlefield experience but in my case I like going through the single player component of a title first before diving into the online side of it. And the truth is they’ve never really been able to come up with something that compares to what comes with Call of Duty titles, with the exception of the Bad Company spinoffs, but they may have history on their side this time. Choosing to have someone representing the Harlem Hellfighters as the cover soldier (much better than the usual generic flame lit guy of the past) will help bring more players into a game that represents a conflict that was centred around Europe and its neighbours. But I really hope they don’t stop there. Here in Australia one of the most important days on the national calendar is tied directly to events from that very conflict. So if EA decided to publish Battlefield 1: ANZAC Edition with content related to Gallipoli or involving the Australian Light Horse Regiments, no matter how tacky it may seem at first there’d be plenty of people snapping it up simply to get a sense of what it might have been like at that time. Previously there’s been some criticism of World War One being a setting not friendly to gamers because of the use of trench warfare during the conflict but that’s just scratching the surface. It was also a time when military technology evolved rapidly. Cavalry were in the twilight of usefulness as tanks entered the battlefield. Aircraft quickly proved to be a useful asset in reconnaissance and offensive roles. Chemical weapons were used to devastating effect, so such it changed many countries perspectives on their future application. 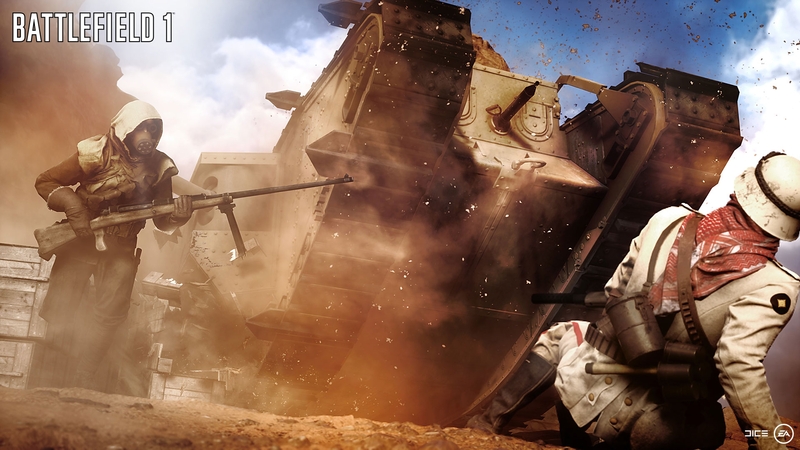 Tanks, deserts and big guns… yep, still Battlefield. In terms of gameplay, it still presents existing Battlefield players with many of the same resources they’ve previously had at their disposal but with new quirks. Planes were flimsy, tanks were unreliable and chemical weapons effects could be felt long after they were used. How that might impact the game is open to debate but it may help achieve a level of balance between players on foot and in vehicles that hasn’t been seen before. On a historical note, both Winston Churchill and Adolf Hitler served in their respective armies during that period too with the experience influencing their actions leading into the next war. So there is a great deal here that leads into the following thirty years of world history. Of the two games, the one I’m most curious about is Battlefield 1 as I have hopes of it coming up with an experience I’ve not seen before in a shooter. Though their track record with campaigns is average, their willingness to go all in with the subject matter could work out really well for them. The possibility of space combat in Infinite Warfare has potential to make at stand apart from even its own franchise siblings but I’d really like to see if that experience carries over from the single player campaign and into multiplayer, giving players more time to enjoy it. A game called “Infinite Warfare” really does need a random mission/map generator to justify the name too. 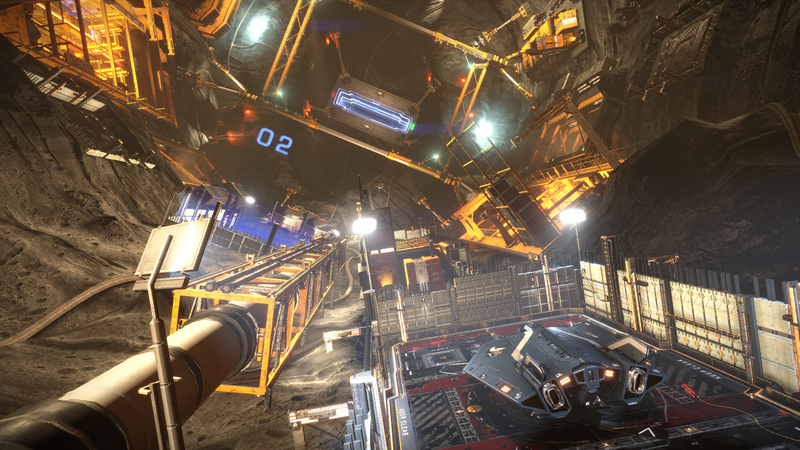 Time will tell when both are released later in the year for PC, Xbox One and PlayStation 4. Battlefield 1 is due to arrive October 21 followed by Call of Duty: Infinite Warfare on November 4th. What do you think of the new games and has your impressions changed now that both are pursuing very different settings in achieving the same goal? Feel free to share your thoughts in the comments below. I think it is incredibly smart from a business side for DICE to go the WWI route to capitalize on the COD fanbase who have been seeking a historical shooter. I have a similar mind as you in regards to the campaign and truly hope I can see a part of history I have only read about brought to life in a unique way. In regards to Infinite Warfare, I know Activision realizes they need to keep doing unique ground-breaking things to keep the COD franchise fresh and exciting but they haven’t gone about it in a good method. I agree with all of your points around bundling a re-master of MW in to the new COD game, it really has the reverse incentive they are looking for. I do believe futuristic space COD has some potential but they need to treat it as something new and fresh instead of going through the same motions of global war, terrorists, the same old themes from other games are still to prevalent. I also don’t think the game is a bad idea but that trailer was awful. It is a poor attempt to generate hype with showing us very little about how the game will actually play and feel. Those scenes at the beginning were so choppy and disjointed…ugh. Once it got to space though I started to feel some excitement but continue to worry the actual space piece will be poorly implemented or simply a smaller piece of the game then they are advertising. Thinking back I remember how CoD made use of both large moments in history (The Battle of Stalingrad in CoD2) and small details (snipers tied to trees in CoD:WaW) to get players immersed and I do miss that. Having to constantly come up with new fiction for possible “future” conflicts I think is going to be a case of diminishing returns unless they choose a “universe” that works and stick to it for a couple of games. But then the Modern Warfare series fizzled out a little at the end and Black Ops had a really cool premise with flashbacks that was lessened too quickly in the sequels pursuit of future tech so I suppose it’s not like they aren’t trying. ahh the memories of Stalingrad…really so impactful cause that was the age that I was obsessed with military things and learning about WWII. I was greatly surprised and impressed by the story of Black Ops 1. They completely failed to capitalize on that sadly. It probably isn’t so surprising that most of the gamers I have talked to are definitely onboard for Battlefield 1. I thought the trailer was fantastic and I’m much rather interested in a historical setting than a fictional (yet again) future setting. We’ve already had COD: Advanced Warfare and Black Ops 3. Gamers the world over are definitely making their displeasure heard with the direction Infinity Ward is taking. I have to admit though the re-master COD – Modern Warfare is still enticing. I just wish they’d release that as a standalone product so I don’t have to consider Infinite Warfare.